In spite of the “No Trespassing” sign in the door, I chose this photo for the theme “Home”. It was home for eight years for my great-great-grandfather and his parents, sisters and brothers. This cabin, roomy for the 1820s nearly on the frontier (southwestern Ohio) has been restored, but still stands on the small hill near Shandon where my ancestors worked and played. It was not merely their home; it was also a school, the Thomas Select School, now on the National Register of Historic Places. 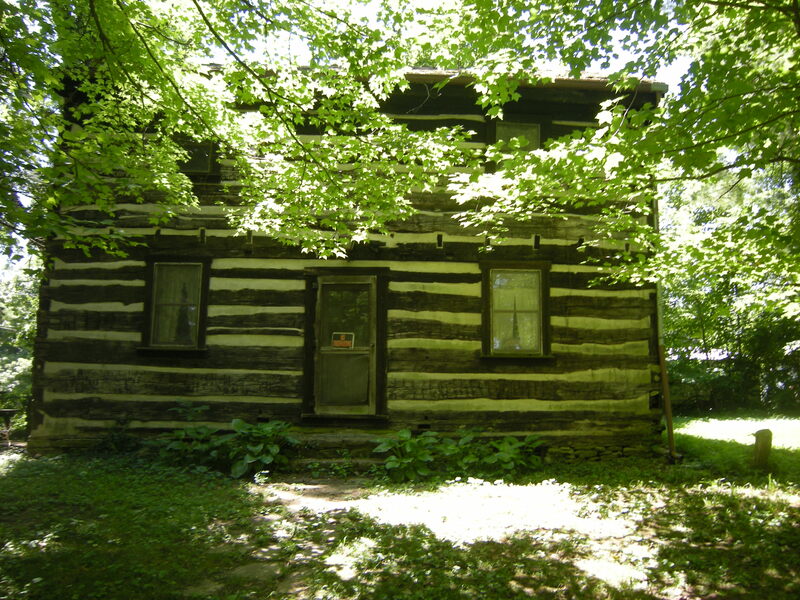 The web site of the Ohio Historic Preservation Office of the Ohio Historical Society, says the building, also known as the Log Manse, “is significant as an early, although altered, Ohio log structure. … By 1820, it housed a private boarding school where students were taught grammar, math and science. Local girls also went to the school to be taught plain and ornamental sewing. The school was operated by the Whitewater Congregational Church, later known as the Paddy’s Run Congregational Church.” The Rev. Thomas Thomas (My great-great-great grandfather) and his family settled here, having emigrated from England two years earlier. He had been appointed co-pastor of the church so the family moved here from Cincinnati. Until 1823 church services were also sometimes held here, until a new meeting house for the church was built. Last summer my husband and I took an ancestral tour through southwestern Ohio and southeastern Indiana, seeing a number of churches, landmarks, and cemeteries associated with my paternal grandmother’s side of the family. I am working on a genealogical history to be published for my family. Of all the sites we visited, this cabin was most meaningful, as I contemplated standing on ground where my ancestors also stood, gazing at the cabin that was a familiar sight to their eyes – their home. I found this site looking for history of the Thomas Select School. I am descended from ELIZABETH THOMETH THOMAS; she was my Great Great Grandmother. I would like to share research. Thanks for your comment! I have put a lot of genealogy info on my ancestry.com site. If you add information to that site and it matches mine or others’, you will get notification and they will ask you to update or add any additional information. I would love to share research with you! I am in the process of researching the ancestors of my father’s mother. She is descended from Thomas Thomas (my gr-gr-gr grandfather) and Thomas E Thomas (my gr-gr grandfather, son of Thomas Thomas). My husband and I took a trip to Ohio last year to meet cousins – other descendants – who had researched the family tree and taken a trip to see the family sites. We visited not only this house (which became known as the Thomas Select School) but also grave sites, churches where Thomas E Thomas was pastor, and other sites. I also found a little bookstore in one of the towns where I bought some books that included more information about them. I have not been working actively on this lately, but perhaps sharing research will motivate me to get back to it! I will contact you via email and give you my email.